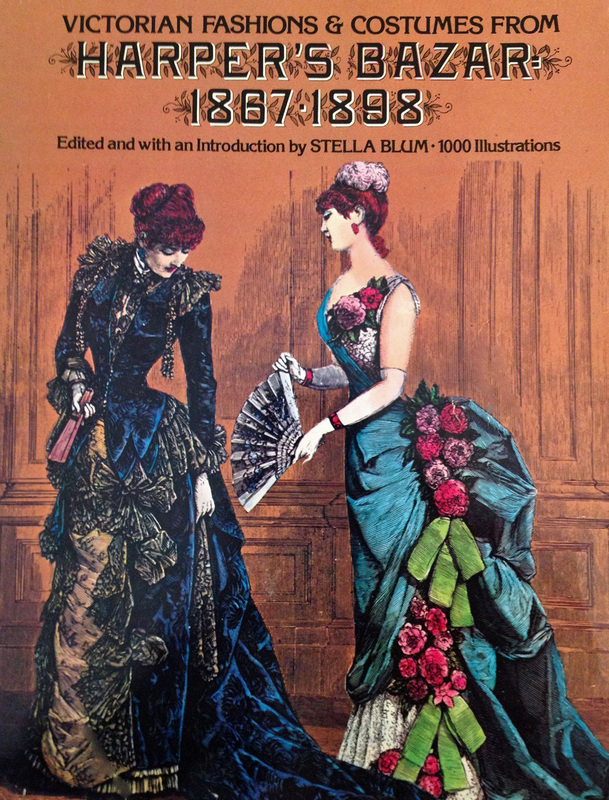 This book is filled with fashion plates from the 19th century Harper’s Bazar magazine. 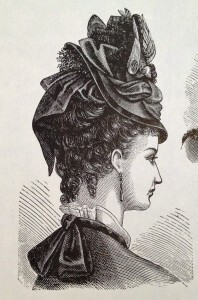 It’s divided into sections according to the major fashion silhouettes: Bustles and Puffs (1867-1874); Natural Form and Cuirass Body (1875-1882); Return of the Bustle (1883-1890); and Hourglass Figure (1891-1898). The images are black-and-white engravings, but they’re very detailed. Beneath most of the illustrations are brief descriptions taken directly from the original magazine. If you’re studying the history of fashion, this book is a must-have. This was the first historical costuming book I purchased, so it holds a special place in my heart. Besides the sentiment, it’s absolutely drool-worthy. 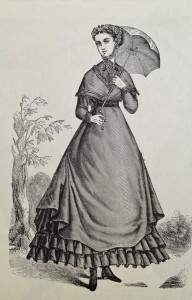 More than a thousand Victorian fashion plates! And not just dresses, but bathing suits, sportswear, undergarments, outer garments, and accessories, like shoes, hats, parasols, and jewelry. There are even illustrations of hairstyles! I also love the fact that the images are copyright-free. You’re permitted to use up to ten of them per project or publication. If you need more than that, you can write to Dover Publications for permission. Whether you’re a student of fashion history or just a costume buff, you’ll want to add this book to your wish list. You will learn a great deal from studying the fashion plates. And who knows? You may be inspired to try sewing a particular dress that catches your eye. Note: Yesterday’s Thimble is a participant in the Amazon Services LLC Associates Program. Basically, this means if you click a link to an item that Amazon sells, and then buy it, I earn a small fee that helps support this website. This entry was posted in Thursday's Book Reviews and tagged Book Review, Fashion Plates, Thursday, Victorian. Bookmark the permalink. I love this book – but I love Victorian dresses and fashion and so I guess I’m biased I agree totally with your review, Stella. Thanks for commenting! There are a few different books out there on Victorian fashion, but this one remains my favorite. I even have it for my Kindle, which is kinda weird, but you never know when the mood to browse through historical fashions will strike!